Oxford, UK, 19 March 2018 – Fuel3D, which develops innovative 3D scanning solutions across a range of industries, is relocating its UK headquarters to The Oxford Science Park, one of the UK’s leading parks for science and technology companies. Expected to move in during June, Fuel3D will be the first occupier of the Park’s new Schrödinger Building, which will accommodate both office and laboratory facilities. The move marks an important phase of the company’s growth plans, and the innovative culture at The Oxford Science Park and the local cluster will play an important role in its expansion. Spun out of the University of Oxford in 2005 and focused on the application of 3D technologies, Fuel3D’s platform is used in advanced healthcare, security and retail solutions. Its newly launched healthcare product, BioVolume™, is a subcutaneous tumour scanning and measurement system for use in preclinical oncology research, making measurements more accurate and efficient resulting in faster drug development. 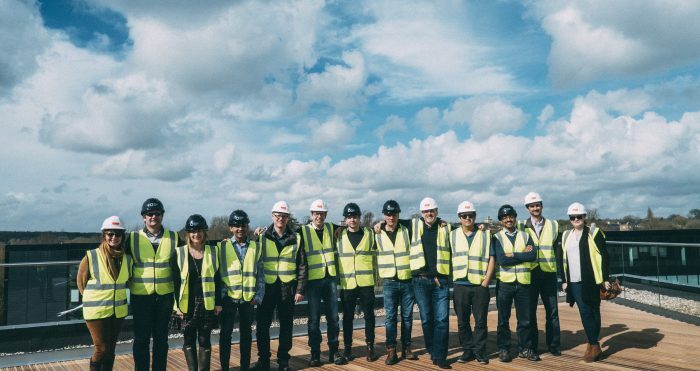 Over 100 Fuel3D employees are expected to work at The Oxford Science Park by the end of 2020, which will see the company double in size. Named after the theoretical physicist Professor Erwin Schrödinger, a Nobel Laureate and Magdalen College, Oxford, alumnus, the new state-of-the-art office and laboratory building has been constructed to promote collaboration and cross-fertilisation of ideas. Providing 61,500 sq ft of accommodation, the £13m building is the first new building on the Park for a decade and is expected to house 300-400 people once completed. The two-wing four-storey building has been designed to be both visually interesting and environmentally friendly, with a panoramic roof-terrace. The Oxford Science Park is owned and managed by Magdalen College. Carter Jonas represented The Oxford Science Park. Fuel3D develops innovative 3D scanning solutions for leading global brands and pioneering organisations. Our technology is re-defining solutions and inspiring better experiences across a wide range of industry sectors from medical research to security and retail. Born out of Oxford University, Fuel3D has offices in Oxford, UK and Greenville, North Carolina, US. We are at the forefront of innovation in 3D technologies with our core technology platform which rapidly and accurately captures and analyses texture, colour, shape and volume data, making it a world-class solution for organic subjects and human form applications. For further information visit fuel3d.com or follow @fuel_3D on Twitter. The Oxford Science Park is owned and managed by Magdalen College, Oxford. Created in 1991, the Park upholds the College’s heritage and provides one of the most influential science & technology environments in the UK. There is half a million square feet of workspace accommodation across the Park, which is now home to nearly 2,500 people and over 75 businesses. These range from start-ups based in the Magdalen Centre innovation hub to major international companies and include Circassia, IBM, OrganOx, OxSonics, Oxford Nanopore Technologies, Sharp Laboratories, Oxford Genetics, ProImmune and Oxford Technology Management.